The main Spanish publishing house specialized in didactic material and educational resources for the Personal Image sector, presented at IES El Palo its online platform: "e-Videocinco didactic resources" to teachers from the province of Malaga. 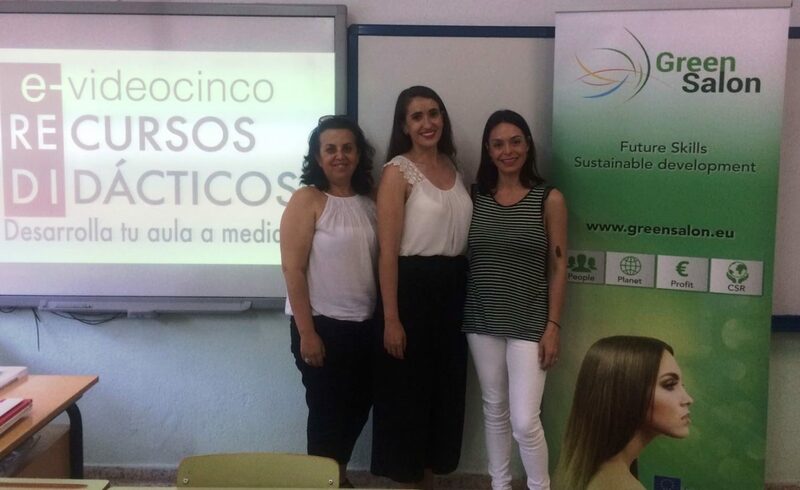 In the course of the day we knew the main novelties and contents that Videocinco will develop and we agreed on the need to improve the knowledge of teachers and students in issues related to the sustainability and safety of personal image professionals. For this reason, our partner Esther López Merino representing the European Green Salon Project, and Marisa Roo Ces responsible for Communication and Marketing of Editorial Videocinco, agreed to include in the e-videocinco platform the link to the web www.greensalon.eu, so that the interested persons can use freely the didactic material generated in the framework of this European project.